• Students will construct a confident educational foundation of the knowledge necessary in performing the duties of an Athletic Trainer. • Students will use evidence to inform practice. • Students will demonstrate competence in the practical skill necessary for performing the duties of an Athletic Trainer. • Students will integrate educational foundation and practical skill in clinical practice. • Students will model the appropriate behavioral and social attitudes necessary in an athletic training practice environment. • Students will develop the competence needed for the care of culturally diverse patients. • Students will partner and collaborate with students and practitioners of other health professions. • Students will promote and demonstrate acceptable standards of ethical conduct for professional practice as detailed by the NATA Code of Ethics, The BOC Standards of Professional Practice, and the state of Ohio’s Laws and Rules Regulating the Practice of Athletic Training. • Students will value life-long learning through involvement in a number of professional development opportunities which include (but are not limited to) the Greater Cincinnati Athletic Trainers’ Association (GCATA), the Greater Dayton Athletic Trainers’ Association (GDATA), the Ohio Athletic Trainer’s Association (OATA), the Great Lakes Athletic Trainers’ Association (GLATA), and the National Athletic Trainers’ Association (NATA). • Students will meet and exceed the standards of the Board of Certification (BOC) examination. 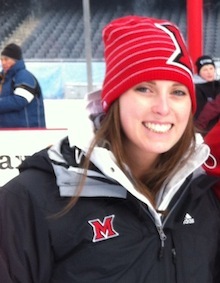 The mission of the Athletic Training Program (ATP) at Miami University is to prepare educated professional athletic trainers through academic and clinical education in which students develop competency and proficiency of entry-level skills for successful completion of the Board of Certification (BOC) examination and placement within the athletic training profession. We seek to advance highly competent healthcare providers who integrate current evidence, clinical expertise, and patient values in practice. Students will develop skills in prevention, clinical evaluation, immediate care, therapeutic intervention, and administration. Areas of study include anatomy, biomechanics, therapeutic exercise, and modalities. In addition to the formal course requirements, clinical experiences under the direct supervision of a Certified Athletic Trainer (ATC) are required to successfully fulfill the program requirements and to attain competency and proficiency of the required skills. Assistance is available to all students admitted into the program in finding placements to complete the clinical requirement. This requirement will be attained through scheduled clinical experiences with assigned clinical preceptors. Placements shall include practices and competitions with Miami University Intercollegiate Athletics, local high schools, clinics, and other affiliated clinical rotation sites. The Athletic Training major at Miami University leads to the Bachelor of Science in Athletic Training degree and is accredited by the Commission on Accreditation of Athletic Training Education (CAATE). Students who successfully complete this Athletic Training Program (ATP) will be qualified and eligible to take the Board of Certification (BOC) examination. Institutions are required by the Commission on Accreditation of Athletic Training Education (CAATE) to provide the program’s employment/placement rate for the most recent three graduating cohorts within 6 months of graduation. Institutions are required by the Commission on Accreditation of Athletic Training Education (CAATE) to provide the program’s retention and graduation rates for the most recent three academic years. Retention Rate measures the percentage of students who have been admitted to the professional program who return to the institution to continue their studies the following academic year.Graduation Rate measures the progress of students who began their studies as full-time, first-time degree seeking students by showing the percentage of these students who complete their degree within 150% of normal time for completing the program in which they are enrolled. "At Miami, I have been working with our various intercollegiate teams since my sophomore year and have had a ton of hands on learning and great professional experiences. It's one thing to learn about injuries and special tests in the classroom, but it is even better when you are out at practice seeing the injury that was discussed in class occur right in front of you and the steps that happen after an injury occurs. 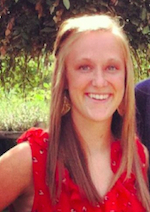 "Now as an athletic training student, I haven't exactly had the typical college experience. During the week I not only have class and homework, but practice with a team as well which can sometimes include traveling or weekend games. Although it is a big time commitment and I have more responsibilities than other students, the opportunities and professional experiences I have had are priceless and have put me in a great place to succeed after I graduate in May and start working as a graduate assistant athletic trainer with a brand new D1 football program in Georgia. Just have to pass my certification exam first." Not only am I gaining hands-on experience with Division-1 athletes, but I’m also learning how to become a medical professional everyday in the training room. Athletic training is such a unique major because the time spent on the field and in the training room is sometimes far more valuable than anything you can learn in the classroom. Throughout my time as an athletic training major thus far, I have had the opportunity to work with a variety of Miami University athletic teams in addition to spending a semester at a high school. One of my favorite aspects about my major are the strong relationships that I’ve built with the Certified Athletic Trainers at Miami and the tight-knit group of athletic training students that have become some of my best friends.